Lot Detail - Mike Richter's 1988 Olympics Team USA Signed Game-Worn Pre-Tournament Jersey - Photo-Matched! 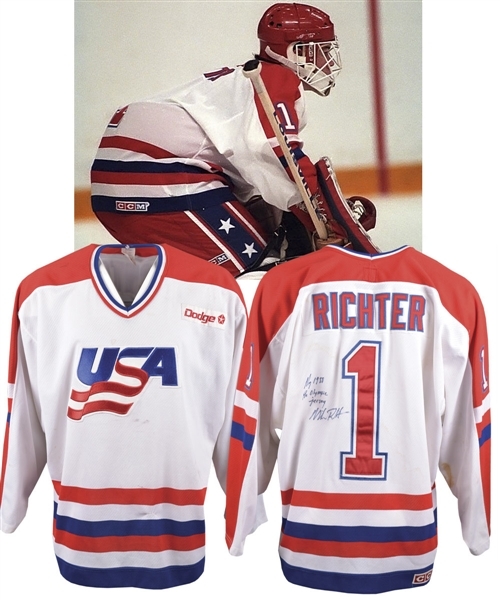 Mike Richter's 1988 Olympics Team USA Signed Game-Worn Pre-Tournament Jersey - Photo-Matched! Mike Richter has added a wonderful note on the back of his game-worn pre-tournament Team USA jersey from 1988. The uniform is by CCM with the Maska Air-Knit tag in the collar over a sewn-in "88" patch. A faint "54" in ballpoint has been marked on the tag. A Dodge sponsor patch is sewn on the left breast. Mike has signed on the back in blue beside his number 1 adding "My 1988 Pre Olympic Jersey". This historic shirt from the dawn of the goaltender's career shows outstanding wear, with extensive areas of rust-colored staining on the back and arms and a team repair on the belly. The black stick mark on the rear hem close to the embroidered CCM patch has been matched to a digital action image that will accompany the lot. The New York Rangers selected Richter straight out of prep school in the second round of the 1985 NHL Entry Draft. He then attended the University of Wisconsin for two seasons (1985-87), before leaving school to join the U.S. Men's National Team in preparation for the 1988 Olympic Winter Games. 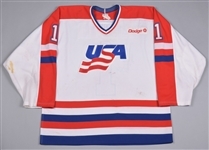 He remained with the U.S. program for the 1987-88 season. The action photo that depicts the photo match was taken during the January 18th, 1988 match against Team Canada held at Maple Leaf Gardens in Toronto. The game was a warm-up for the upcoming Olympics in Calgary. The photo-match is from the January 18th 1988 game vs Canada played at Maple Leafs Gardens (Getty Images #464496124).